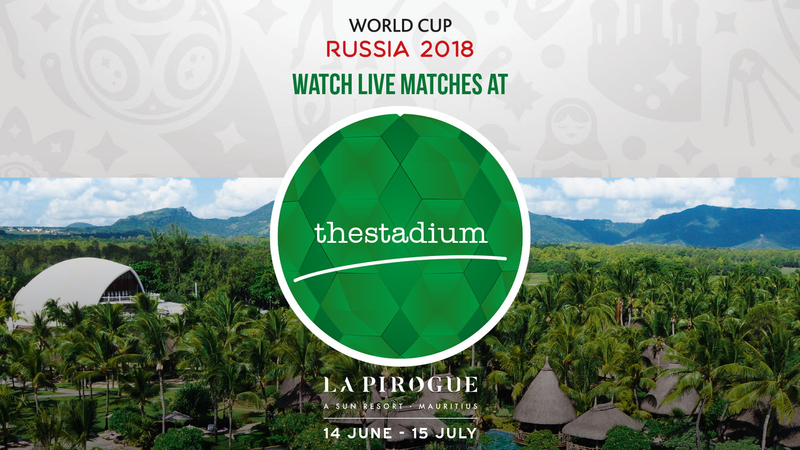 Come and join us in our two World Cup domes at La Pirogue, A Sun Resort, Mauritius from June 14th to July 15th. We will broadcast each and every game live on our 6-meter giant screen, while DJ Shehzad entertains you with some great sounds in between games and after each goal. One dome will cater for more of a standing pub feel while the other will be featuring more of a stadium vibe with VIP seating and service. A beer garden provided by Gister beer will be set up a by the sea to offer spectators a variety of snacks, sandwiches and other titbits. 5) This ticket is a revocable license and the Management of Sun Resorts Hotel Management Ltd reserves the right, without the refund of any portion of the ticket purchase price, to refuse admission or to eject any person who fails to comply with the rules of the venue and applicable laws. 10) This ticket may not be used for advertising, promotion or other trade purposes without the express written consent of Sun Resorts Hotel Management Ltd.
11) The ticket user consents to use of his/her image or likeness incidental to any video display, transmission or recording of the event by Sun Resorts Hotel Management Ltd, the venue or the artist. 12) The use of cameras, video or audio recording equipment is prohibited unless otherwise indicated by Sun Resorts Hotel Management Ltd, the venue or the artist.